Harmar delivers an industry-leading 600-pound capacity with the all-new Pinnacle SL600HD stairway lift. 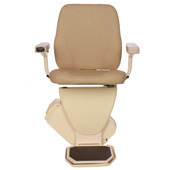 Extending the many benefits of the Pinnacle’s patented Worm Drive, the SL600HD features a premium ride, little to no maintenance, comfortable seating, and ease of access with a 90° swivel -- now with extraordinary lifting capacity. The SL600HD offers up to 40’ of travel; contoured 25” wide seat with extra-high molded seatback and attractive upholstery. Heavy duty seat, arm and footrest. 3 year warranty on parts, 10 year warranty of gear rack and 1 year on batteries.